Hossein Ronaghi Malki, one of the 35 arrested earthquake volunteer aid workers in East Azarbaijan, is in dire condition, due to kidney hemorrhaging as a result of the beatings he suffered during his arrest. All but eight of the arrested aid workers have been released on bail. Hossein Ronaghi was moved to the quarantine section of Tabriz Prison five days ago, awaiting a transfer to Evin Prison in Tehran. A close source to Hossein Ronaghi told Deutsche Welle that, despite the claims of an official calling Hossein a runaway prisoner, Hossein was on an approved medical furlough that had been extended until September 5. The source told Deutsche Welle that Hossein’s family had a visit with him yesterday (Sunday September 16, 2012) and noticed his entire body is swollen and he is suffering from hemorrhaging. His kidneys are not functioning and the doctors have advised that they should be removed immediately. Following his arrest on August 23, 2012, Hossein was transferred to Tabriz prison where he has been incarcerated in the quarantine section of Tabriz prison for five days now. According to a witness, Hossein was severely beaten during arrest which resulted in kidney hemorrhaging and temporary unconsciousness. He had undergone a kidney operation in the previous month. Hossein Ronaghi Maleki used to operate a blog under the alias of Babak Khorramdin. The site was very active in the field of anti-filtering software. 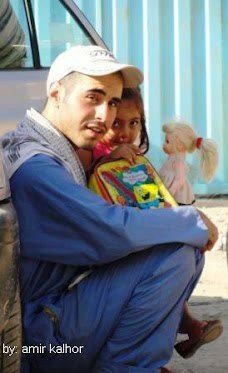 He was sentenced to 15 years imprisonment on charges of anti-regime activities by waging a soft war. 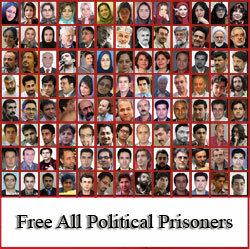 During his incarceration Hossein launched a number of hunger strikes. His last hunger strike protested the denial of a needed medical furlough which resulted in approval of a medical furlough by the authorities. After the earthquake in East Azarbaijan, Hossein along with 34 other volunteers collected aid supplies for the earthquake victims and took them to the earthquake-stricken areas. But they were arrested and all the relief supplies were confiscated. They were charged with distributing unsanitary supplies and mildewed food items, a charge which they all denied. Fourteen of the arrestees were released 24 hours later and thirteen were released on bail in the following days, but eight remain in custody. Human rights activist Navid Khanjani, who was out on bail at the time of arrest, has since been transferred to Rejaei Shahr prison in Karaj.